Calculating the square root of pi or taking on a challenging crossword puzzle might not be on your child’s agenda this week but they can be next week. And they can be fun! With these uber clever cushions from Gallop Lifestyle, that is. Neutral in colour but with so much to say, these cushions are sublime for any kid’s bedroom. They’re just a jumble of letters and numbers at first glance but look closer and there’s lots to be discovered and deciphered. 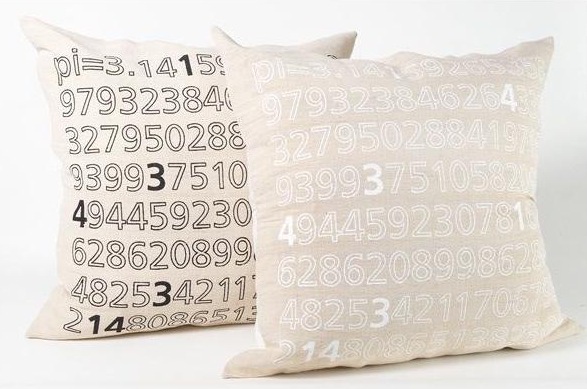 The ‘Numbers‘ pillow features the square root of pi. It’s 3.14, for those who can’t remember their high school maths, and these numbers are bolded throughout the square root and hence throughout the pillow. Way cool! 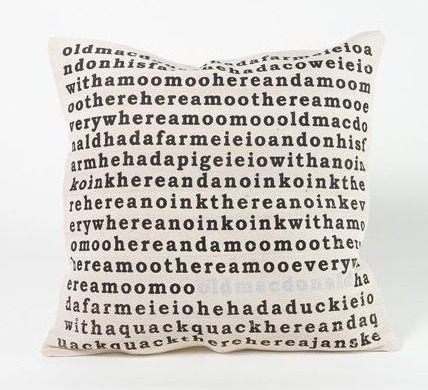 The ‘Old MacDonald‘ cushion (my fave) is just so brilliant. It features the nursery rhyme ‘Old MacDonald’ in its entirety and with no spaces. 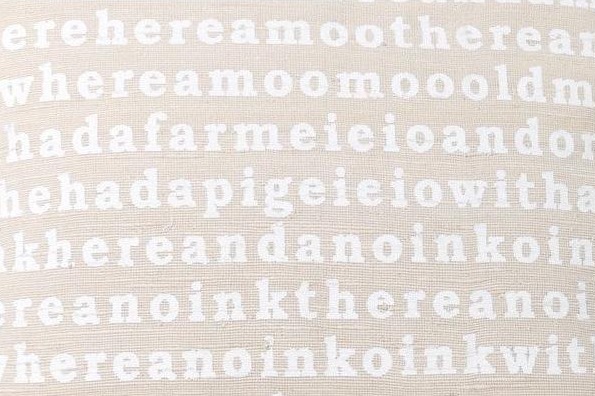 So it looks like a whole lot of random letters until you see the Old MacDonald has been highlighted and you pick up certain words like ‘moo’ and ‘oink.’ That’s when it clicked for me and I started singing the song from the cushion. I imagine my daughter would love this pillow to bits and we’d have a fabulous time singing together! Make your way to Gallop Lifestyle to purchase. Expect to pay $79 for a small cushion or $115 for large, plus postage.